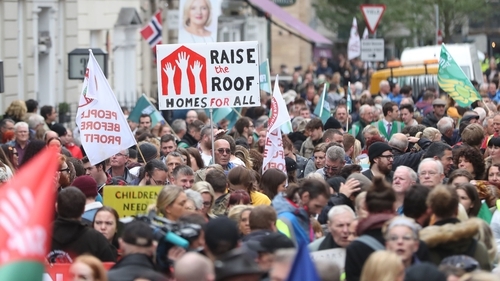 Thousands of people from around the country have taken part in a national protest in Dublin to highlight the housing crisis. Students joined trade unions, housing and homeless charities, and civil society groups to highlight the impact of the accommodation crisis in the 'Raise the Roof' rally. To cries of "Student homes, not student loans", protesters were forced to stop on an adjacent street because there was no room for them to turn on to Molesworth Street, which faces Leinster House. It is estimated that around 12,000 people took part in the rally. The protesters had marched from the Garden of Remembrance to Leinster House. Following the rally, at least 100 students staged a sit down protest outside Government Buildings. Merrion Street has been closed to traffic. The demonstration comes ahead of a motion in the Dáil on homelessness and housing. Outside Leinster House, protesters joined members of ICTU, opposition parties and housing groups. The Union of Students in Ireland called on all political parties to support the cross-party motion in the Dáil to take immediate action on rent increases and to make significant investment in affordable purpose-built student accommodation. Students from Dublin Institute of Technology told RTÉ News that they were attending the rally to "make a stand" on the issue of homelessness and substandard accommodation. They expressed concern that Dublin was returning to tenement conditions and that "history is repeating itself". One student spoke of paying €540 a month for what he described as a tiny room a 45-minute commute from his college. Students also criticised "digs" that were being advertised that charged high rents but placed severe restrictions on tenants, such as restricting access to the kitchen and requiring them to leave at weekends. A Carlow IT student said he spends up to four hours a day commuting to college from his home in Wicklow because he cannot afford the rents in Carlow town. Chris Doyle said he gets up at 6.30am every morning to catch a bus at 7.30am. He said it is usually 7pm or 8pm at night by the time he gets home again. He says he has been been forced to give up sport, which he loves, as a result of his long commute. USI President Síona Cahill said: "On the night of the Census in 2016, there were 429 students homeless in Ireland - making up 8% of the total homeless numbers. "There are students effectively being locked out of college because they cannot find or afford suitable accommodation while they study. It's not good enough and it's affecting access to education." In the Dáil, Taoiseach Leo Varadkar defended the Government's handling of the housing crisis. He noted that people involved in the Raise the Roof protest were expressing concern and he acknowledged that there was huge concern across the country. Among the speakers at the rally was Sheila Nunan, President of the Irish Congress of Trades Union. She told the crowd: "It is an emergency when students cannot afford to go to college or families cannot afford their rent. "It is an emergency when rent is no longer payable and too many people are disposed and homeless. "Ten thousand homeless people is too many and it is a scandal when thousands of children are living in hotels, hostels and bed and breakfast. "Housing is a basic human right. Too many of our citizens are affected." Those taking part included representatives from the Dublin Council of Trade Unions, SIPTU, Irish Coalition to End Youth Homeless, Dublin West Housing Association, National Union of Journalists, Mandate trade union, Fórsa, Union of Students in Ireland and Irish Congress of Trade Unions. Singers Damien Dempsey and Frances Black also performed during the rally. Following the rally, gardaí were forced to step in and separate activists from the Labour Party and some members of homeless organisation A Lending Hand after the two clashed.